As is the way for every student in Year 10 at Sydenham School, I had to go out on two weeks of work experience. After research into various businesses and emails to and from several contacts, I eventually decided that Red Badger would be my choice of place for the two weeks. Laura arranged a phone interview which was a great introduction. It was a mixture of things that led me to this decision: reading Tian’s blog post about work experience, the office dog, the generally nice feel to the company having read up about it, and speaking to Laura. I arrived at Old Street tube station at 9:40 am on Monday 2nd July, incredibly nervous, but also very excited. After successfully locating the Red Badger office, I had some time to kill so my mother and I waited in one of the many nearby Prets until it was time for me to go into the office. Nervous and unsure what to expect, I went to the front desk, got my pass and took the lift up to Red Badger. Once I had met Becca and a few other badgers however, I realised that there was no need to be nervous. Everyone at Red Badger was very friendly and welcoming, and the office as a whole had a very informal and comfortable feel to it. After being shown around the office and being given a brief induction, I was introduced to Pedro, one of the engineers who I would be working with on pair programming over the duration of my time at Red Badger. Pedro helped me to set up my laptop with packages such as Git and Homebrew which I would be using during my time at Red Badger. On the second day we looked at flexbox wrapping in CSS, and Pedro showed me a game called Flexbox Froggy which was a fun way to test what I had just learned. All of these projects can be found here. Over the two weeks, I learned so much from Pedro and I am very thankful for all of the knowledge that he has been able to give me as a result of it. On one of my days at Red Badger, I was also lucky enough to spend some time with Joe Paice, looking at the Pride in London app that had been developed, he showed me how they were working on fixing bugs or errors in the app. I was even able to help him fix a few of these (although he did most of the real work). I also helped Becca with various small jobs at Red Badger, mostly in preparation for Pride. We prepared water bottles for the Badgers to hand out to people at Pride. We carried the bottles from storage, and then added Badger Pride stickers to them. We also collected some balloons for Pride from the local costume rental shop. I went along to Pride myself and was proud to take my own Badger bottle with me. Over the course of my two weeks at Red Badger I had the chance to talk to a few people here at Red Badger. On my second day I had a lovely discussion with Julian about the company and what he likes about it (reliability - always knowing that something good will be produced - good quality software etc). I also talked to Cain, one of the founding members of the company about Red Badger and what it was like to start the company. Another discussion I had was with Rane and Abi about resources to use to further programming ability. 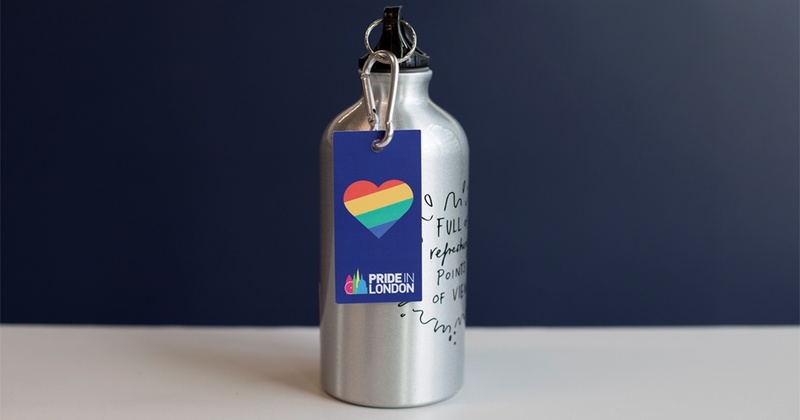 I talked with Sam about branding and was lucky enough to help him design a bottle tag for the bottles that were going to be handed out at Pride. I talked with Andreas and Monika about design, briefly going over many concepts such as visual design and UX design, which both relate to each other. It was interesting to learn the importance of the consideration of the paths that the customer may take in order to find products and to understand what factors have to be considered when designing digital products. Andy Craig and Lani went over The Badger Way and the agile methodology. I learnt about the use of Scrum and Kanban boards, and the use of the agile methodology to produce MVPS (minimum value products) that could be released and easily developed upon. I also had a talk with Ingrid about sales and her role in the company in regards to clients and presenting the services of Red Badger to potential clients. At Borough Market, I had lunch with Nico and Joe Paice on one day (Joe very kindly paid for my lunch which I am very grateful for). It was good to talk to Nico and find out about her life and how she came to be at Red Badger. It was particularly interesting to hear about the days when she would offer companies websites or other simple digital services in exchange for food. On one of the days I was lucky enough to visit some Badgers on-site at their client’s offices . I learned about their work in regards to forms and UX there and the expansion of the project over time. My experience at Red Badger was a truly lovely one: the environment was comfortable and welcoming one, the office was informal, and the people were all super friendly. I have gained so much from it - in just two weeks, not only have I improved my ability in relation to programming, but my confidence has grown significantly, from being really shy and nervous on the first day, to talking about Pokemon with Pedro on the last. It was also really useful to learn about different roles within the company and the different perspectives from which tasks are approached at Red Badger. I had a great two weeks and I am thankful to all those who made it possible. Thanks to Laura for organising the two weeks. Thanks to Becca for looking after me during my time and taking me to Itsu for lunch. Thanks to Pedro for sharing so much knowledge with me and for being a great person to do pair programming with. And thanks to everyone else at Red Badger for being so welcoming and friendly towards me, I really enjoyed my time!